Heaven’s Best provides business carpet and floor cleaning services throughout the Birmingham, AL area. Have you thought about what customers think when they walk into your business? When people come through the doors of your business, they are analyzing everything, deciding whether or not they will become your customer. You may not notice it because you are there every day, but over time your carpets and floors can start to show signs of wear and tear. This can look unsightly and unprofessional to clients or customers. Entrance ways and high-traffic areas can really show signs of wear and tear, and these are the areas that your customers will probably see first. These areas are especially prone to dirt, dust and grime. A professional floor cleaning service like Heaven's Best Carpet Cleaning can keep your floors looking like new. Heaven’s Best can remove day-to-day buildup of dirt, as well as scratches and scuffs that accumulate over time. Heaven’s Best can handle all types of floor types including VCT tile, Tile and Grout, and Hardwood floors, as well as all types of carpet. Heaven’s Best offers competitive rates and FREE ESTIMATES. We will come in and measure the area and give you a thorough analysis of your floor and floor cleaning needs. We will work around your schedule and will clean during times that are most convenient for you and your staff. 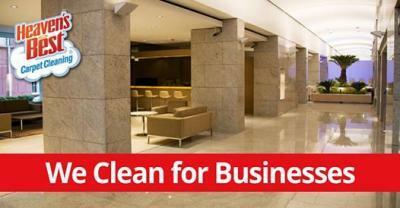 Heaven’s Best will keep your floors spotless and make your business looking great. Call Heaven’s Best today at (205) 618-9150 for a FREE Floor Analysis and Estimate. Don’t wait any longer to have your business carpets or floors cleaned in Birmingham, AL. You will make a great first impression to all your customers by having clean floors or carpets.